It is our favorite time of the year again, that time when we see every new ATV model you can imagine. Recent trends are continuing—there are fewer 2WD sport models on offer, but 4×4 tech remains strong. As much as we lament the loss of sport models, the advancement of 4×4 technology is most likely partially responsible. Riders who once would have bought a sport quad (when 4x4s were basically farm implements) now choose a sporty, long-travel 4×4 for trail use. Modern 4×4 quads have as much wheel travel as many ‘80s sport quads but are far more comfortable off-road. In the youth segment, there are new and numerous offerings of recreational 2WD quads. Some popular sport models from previous years are still available at the distributor and dealer levels, so check around if you want one. It is likely that you will find a new one waiting for a happy and proud owner. We hope that we will see more sport ATVs hit the market, whether they are traditional solid-axle 2WDs or performance 4x4s. But for 2017, there are great options to choose from at great prices. Here we have photos, prices and descriptions of over 90 ATVs that are current for 2017. In many cases, manufacturers make several variations of a model that all look identical externally. Those machines will be grouped under a single photo, and the prices listed will be a range from base to highest MSRP. Arctic Cat’s MudPro 700 and 1000 mud specials comes with their H1 695cc or V2 951cc four-stroke EFI engine. A 3000-pound Warn winch, EPS, front and rear heavy-duty bumpers and aluminum beadlock rims come standard, along with a snorkel kit for deep mudding. The 1000 has a long wheelbase since it shares the 1000 two-up chassis. A potent 951cc V-twin engine with EFI powers this bigbore machine. Independent suspension keeps the ride soft in the front and rear, while hydraulic disc brakes help slow the 1000 XT down. EPS and aluminum wheels come standard. The 4×4 system comes with a locking front differential. The 1000 XT EPS shares the Alterra 700’s 52-inch wheelbase. The TBX is a true utility ATV with a rear dump bed that can hold 300 pounds, and it is $500 cheaper for 2017! It is powered by a 695cc, liquid-cooled, single-cylinder motor with electronic fuel injection. It can tow 1050 pounds through a 2-inch rear receiver. Power steering is a welcome standard option on this workhorse. Arctic Cat’s Alterra 700 is back but dropped a few hundred in price for 2017. These full-size 4x4s sport a 695cc, liquid-cooled powerplant with EFI and boasts an electronic front locking differential. Four-wheel independent suspension uses coil-over shocks. The XT version has power steering and comes with standard aluminum wheels and automotive paint. This 443cc liquid-cooled Cat has a 48-inch wheelbase and 7 inches of wheel travel. There is no base Alterra 500, just the EPS XT version with automotive-style paint and aluminum wheels. Hydraulic disc brakes slow the Alterra down. This full-size quad weighs 615 pounds but carries 225 pounds on the racks and tows 1050 pounds. The air-cooled, 366cc Alterra 400 shares the same frame and suspension as the Alterra 500, including its 7-inch-travel independent suspension and hydraulic disc brakes. It is a little lighter than the 500 at 603 pounds but will still tow up to 1050 pounds and hold 225 pounds between its front and rear racks. It is $300 cheaper than in 2016. The XC 450 is what Arctic Cat considers to be a puresport 4×4. It has a 443cc, SOHC, four-stroke mill that is liquid-cooled and has electronic fuel injection. Like all the ’Cats in the 4×4 lineup, it has an automatic CVT transmission with reverse. This machine doesn’t come with racks, but it will tow up to 1050 pounds. Arctic Cat’s 500 dropped $600 for 2017! It shares a 443cc liquid-cooled engine with the 450XC and the Alterra 500, but it boasts a 50-inch wheelbase and 10 inches of fourwheel independent suspension. It comes with an electronic-locking front differential. The racks carry a combined 300 pounds and will tow 1050 pounds. Bad Boy makes the Onslaught in three levels: the standard model, the 550 EPS and the onslaught EPS Camo. All have four-wheel independent suspension and disc brakes; a liquid-cooled, EFI, SOHC, 503cc engine; and manual diff-lock. The 550 has 25-inch tires, but the two EPS versions have 26-inch tires. The camo model has cast-aluminum wheels. The Renegade is Can-Am’s sportiest 4×4 ATV. The base model comes with a 1000, 850 and 570 engine size options. The Renegade 850 and 1000R come with sport-tuned Fox HPG shocks. It has a CVT transmission, selectable 2WD and 4WD and a locking front differential. The Renegade has 9 inches of travel on each corner. Can-Am’s Renegade X xc line is designed for the woods rider. Twelve-inch cast beadlock wheels, Fox Performance Series 1.5 Podium RC2 shocks and handguards suit sport riding. Either V-twin four-stroke engine is liquid-cooled with EFI. Can-Am’s Tri-Mode Dynamic Power Steering (DPS) comes standard on this machine. Mud riding is a worldwide passion, and Can-Am has mud machines. The X mr 570 comes with 12-inch cast-aluminum beadlock rims that sport 28-inch Maxxis Mudzilla tires. Electronic power steering is standard, and Fox HPG shocks help the X mr 570 perform well. The handlebar comes with a grab handle and handguards. Can-Am’s Renegade X mr 1000R is one sporty, powerful mud machine. This snorkeled machine comes with a 976cc, EFI, V-twin, four-stroke engine. The CVT has a relocated intake and outlet to match the engine’s intake. Thirty-inch Gorilla Axle Silverback tires on 14-inch beadlock wheels and a Warn winch are standard. In 2016 Can-Am had their Outlander L line. For 2017 they got rid of the L but kept the machine. The cheapest 4×4 in Can-Am’s lineup is the 427cc Outlander 450, or you can choose the 570cc V-twin. Both mills are liquid-cooled with EFI. The 4×4 system comes with Can-Am’s Visco-Lok auto-locking front differential. The machine has a 1300pound towing capacity, and power steering is available. The Outlander XT 570 comes standard with a lot of good features. The steering is upgraded to Can-Am’s Tri-Mode Dynamic Power Steering, 12-inch cast-aluminum wheels on 25-inch tires, heavy-duty front and rear bumpers and a Warn winch with a roller fairlead and handguards come standard on the Outlander XT 570. This machine comes with everything a hunter needs. Twelve-inch cast-aluminum wheels come standard, along with 26-inch Carlisle ACT HD tires, aluminum skid plates, a Warn winch, heavy-duty front and rear bumpers, a Kolpin 6.0 Impact gun boot and gear grips. It is powered by a CVT-equipped, EFI, 570cc, V-twin engine. Can-Am’s Outlander X mr 570 is designed for going deep in mud and water, with a radiator located in front of the handlebar to help keep the 570cc V-twin engine running cool. Twenty-eight-inch Maxxis Mudzilla tires are wrapped around 12-inch aluminum wheels. A rugged front bumper comes stock on this Can-Am, along with an automatic CVT. The Outlander 650 has dual-A-arm front suspension and IRS that helps provide a smooth and controllable ride. The engine is a 62-horsepower mill that is liquid-cooled and electronically fuel injected. Towing capacity is at a gracious 1300 pounds with a total rack capacity of 300 pounds. When you upgrade to the DPS version of the Can-Am Outlander, you can choose between the 1000, 850 or 650 engines. Twenty-six-inch tires and 14-inch aluminum wheels add traction and style. Can-Am’s Tri-Mode Dynamic Power Steering allows changing the steering system’s input. You can get an XT version with HD bumpers, a winch and more. The Can-Am Outlander XT-P is outfitted for intensive trail riding and enhanced performance. The XT-P comes in two different engine sizes, along with 14-inch beadlock wheels, Fox Performance Series 1.5 Podium QS3 shocks, HD bumpers and a Warn winch. EPS comes standard, and black is the only color this beauty comes in. Hunters will have everything they need to stalk prey with this burly machine. The 89-horsepower 1000R V-twin engine has a towing capacity of 1300 pounds and a total rack capacity of 300 pounds. Power steering, a Kolpin gun boot, gear grips, a Warn winch, aluminum skid plates, handguards and 12-inch cast-aluminum wheels are all stock on this Mossy Oak Camo-colored machine. 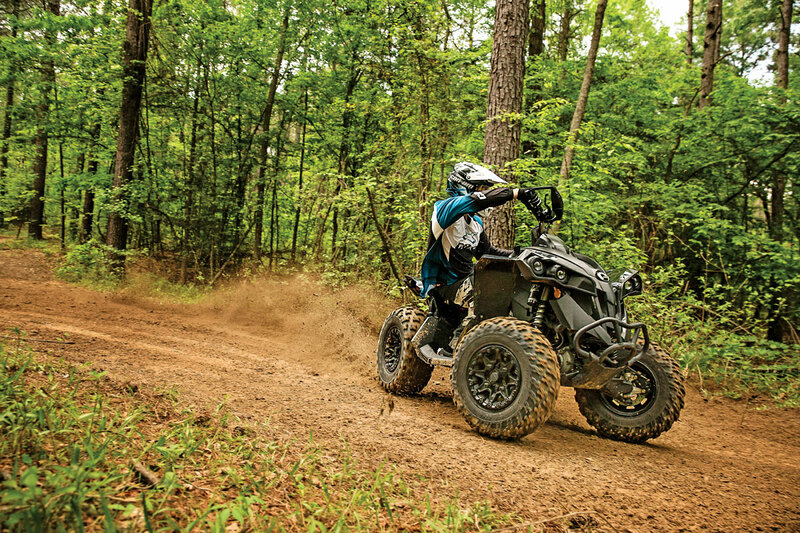 Can-Am’s X mr line holds the big bore Outlanders. The 650 X mr has 12-inch wheels with 28-inch tires, while the 850 and 1000R have 14-inchers with 30-inch mud-specific tires. A Warn winch comes standard on the 850 and 1000R. The X mr 1000R utilizes a longer frame from the two-up Outlander Max and adjustable Fox 1.5 Podium QS3 shocks. Relocated radiators come on all three models. The point of adding two extra wheels to a Can-Am Outlander is to increase hauling capacity and allow a cargo bed that can hold up to 700 pounds. The engine is a 62-horsepower, EFI, V-twin four-stroke that is liquid-cooled. The 6×6 has an extra low gear in its automatic CVT transmission that is controlled through a gated shifter. Electronic power steering is a standard feature on this ATV. The most expensive ATV in Can-Am’s lineup is the Outlander 6×6 XT 1000R. It sports a six-wheel drive system and has independent suspension for each wheel and the 82-horsepower, Rotax, 976cc, V-twin, four-stroke engine. Auto diff-lock and Can-Am’s Tri-Mode Dynamic Power Steering come standard. A 700-pound-capacity dump bed is a great feature of this machine. This new CFMoto 4×4 features a 36-horsepower, single-cylinder, four-stroke engine with Bosch electronic fuel injection. Power is transferred to the 4×4 drivetrain via a CV Tech fully automatic CVT with an engine-breaking feature and reverse. Fully independent suspension comes on the front and rear of this new model. This machine comes with a 493cc, single-cylinder, fourstroke engine with Bosch electronic fuel injection. The 4×4 system has a locking front differential feature and is shaft-driven out of an automatic CVT transmission with reverse. Fully independent suspension comes on the front and rear of this well-priced ATV. Hisun’s Forge 500 and 700 rely on the same body and frame. The 700 has a 686cc four-stroke engine, while the Forge 500 has a 471cc, single-cylinder, four-stroke engine. Both machines feature CVT transmissions, 4WD with difflock, EFI, machined cast-aluminum wheels, handguards and a winch. There are six color options including camo. For a great price, the Hisun Forge 400 has front, independent, dual-A-arm suspension with a single-shock swingarm in the rear. Hydraulic disc brakes; a CVT, 4×4 system with diff-lock; a liquid-cooled, 393cc, fuel-injected, four-stroke engine; and machined cast-aluminum wheels are all standard equipment. The Rancher line gives you a lot of options to choose from. Each model has the same 420cc single-cylinder engine, but you can pick a manual, dual-clutch automatic or electronic-shifting transmission options. You have the option of a solid rear axle, or you can pick independent rear suspension for a smoother ride in rough terrain. With any of these choices, you get the durability Honda provides. The Honda FourTrax Foreman 4×4 provides a larger-displacement 475cc engine over the Rancher line. The model only comes with a solid rear axle, which is great for work and can also be fun out on the trails. If you upgrade to the $8099 Electronic Shifting model, you get push-button shifting and electronic power steering. Wheel-travel numbers in the suspension are 7.28 inches, front and rear. The Rubicon line utilizes a 475cc, single-cylinder, fourstroke engine with electronic fuel injection. The 4×4 system has a front locking differential, and independent rear suspension is standard. You can upgrade to an auto dualclutch transmission, add electronic power steering and purchase the Deluxe model that tows up to 1,322 lb. This is one of Honda’s ATV creations that hasn’t changed much since its inception. The Rincon has a three-speed transmission with reverse that is paired to a big-bore, 675cc, single-cylinder, four-stroke engine that is longitudinally mounted in the frame. Independent suspension wheel-travel numbers are 6.9 inches up front and 8 inches in the rear. Hydraulic disc brakes slow this big quad down. Kawasaki’s big-bore ATV is the Brute Force 750i that comes in three model choices. You can get the base model, the electronic power steering model or the EPS Camo model. All three have a 749cc, EFI, V-twin, fourstroke engine with a CVT. Front and rear independent suspension with 6.7 inches of front-wheel travel and 7.5 inches in the rear. Kymco’s biggest-bore ATV is $2000 cheaper for 2017. It sports a 694cc, single-cylinder, liquid-cooled four-stroke engine paired with a CVT transmission that has reverse. The 4×4 system has diff-lock. The suspension is fully independent. The LE EPS version is $1900 cheaper for 2017, and it has upgraded wheels and tires, plus a winch. The basic MXU 500i enjoyed a complete makeover for 2016, and it shares a chassis with the 700i. It is powered by an EFI, 499cc, liquid-cooled, DOHC engine developing 36 horsepower and paired with an automatic CV-style transmission with reverse. The major change for 2017 is a $1500 price reduction. Kymco’s three versions of the MXU 450i share a 443cc, liquid-cooled, four-stroke engine with a CVT transmission that has reverse. Compared to the 500, the 450 is roughly 60cc less, six horsepower less, but is over 100 pounds lighter. They are $1200 cheaper than last year. Dual front disc brakes and a single rear disc brake handle stopping. The Maxxer 450i is Kymco’s take at a sporty 4×4 ATV, and they did a great job. The suspension is fully independent in the front and rear with five-way adjustable shocks with dual-rate springs. The transmission is an automatic CVT style, and the machine has engine braking for more control down hills. The 443cc four-stroke engine is fuel injected. As hard as it is to believe that a 750-pound 4×4 can be a sport quad, all it takes is a short ride to become a believer. The XP 1000’s 952cc, liquid-cooled, EFI twin, four-stroke engine makes 90 horsepower, and the similar 850cc twin makes 78! Dual-A-arm suspension, adjustable shocks, disc brakes and EPS come standard on both models. For mud fans, Polaris teamed up with High Lifter to bring two full-on deep divers to the 2017 lineup. They both have lower gearing, snorkel kits for surviving deep muck and front-rack-relocated radiators to reduce debris getting lodged in them. The XP 1000 has sturdy front and rear bumpers, high-clearance suspension and a 3500-pound winch. The Sportsman XP 1000 has a powerful 88-horsepower ProStar, twin-cylinder engine and On-Demand all-wheel drive. Power steering comes standard on this powerhouse, and independent suspension softens the ride up front and in the rear of the machine. Cast-aluminum wheels come standard on this ATV as well. Polaris’ Sportsman 850 and 850 SP are strong 4×4 contenders. A true 850cc, liquid-cooled, twin-cylinder powerplant makes 78 horsepower—plenty for sane people! Both get the revised bodywork with deeper, longer footwells. The SP gets body paint, cast wheels, factory mud flares and, of course, power steering and Active Descent Control. Polaris has a herd of the popular 570 4×4 models in a variety of colors. All share a 44-horsepower, liquid-cooled ProStar engine, but they are also different. Only the SP version comes with Active Descent Control and an engine braking system. Power steering and aluminum wheels are also standard features on the SP model of the 570. Polaris caters to customers who use an ATV for work with two Metallic Maroon utility models. They feature steel racks with recessed areas for carrying buckets, special front bumpers with a front hitch to match the rear hitch. Only the 570 has EPS and a new variable low-speed limiter (set 7–14 mph for spraying, mowing or other work). In addition to the Sportsman 450 H.O. Utility Edition, Polaris makes a standard 450 H.O. and a 450 H.O. EPS. The on-demand AWD works quite well with the CVT transmission and 31-horsepower ProStar engine. It has front and rear independent suspension and disc brakes. There is no Active Descent Control, but it doesn’t really need it. You can get this 4×4 quad in multiple options, starting from two different transmissions. One is a full manual fivespeed, while the other utilizes an automatic trans. Both the 400ASi and 400FSi come in a camo-colored option or a special-edition all-black color choice. The four-wheeldrive system is operated through a handlebar-mounted lever, but there is no front differential-locking capability. Suzuki’s KingQuad 500AXi line is designed for sport riding and utility purposes. It utilizes a 493cc, single-cylinder, four-stroke engine that is liquid-cooled and is paired to a CVT with reverse. The machine has a fully independent front and rear suspension with over 7 inches of wheel travel. You can get an EPS version and special-edition version of the 500AXi. The KingQuad 750AXi shares the same frame as the 500AXi, but it carries a big-bore, EFI, 722cc, single-cylinder engine that is liquid-cooled. It has a CVT type with reverse, and 4WD has a front locking differential. You can upgrade to an EPS-equipped model, a camo model and a special-edition model of the 750AXi. For 2017 Yamaha only offers their sport0oriented 4×4 with electronic power steering. The machine has stronger axles and bigger 26-inch tires than the previous year’s 25-inch tires. It uses a 708cc, single-cylinder, four-stroke engine. The CVT is clutched for aggressive riding, and the front and rear independent suspension help the ride. EPS and special-edition versions are available. In 2016 Yamaha took away all versions of the Grizzly that weren’t a 700 and introduced the Kodiak 700. It has the same engine as the Grizzly, but the CVT transmission is clutched to be smoother and quieter for ranch work and hunting. You can get an EPS version and a special-edition version. Racing TT for the first time!